As a horse owner, you may sometimes wish you had the ability to speak the equine language to decipher what your horse is trying to tell you. But actually, understanding their body language is enough, as horses rely on very sophisticated body language to communicate with us and also with each other. There may be the occasional neigh, whinny or snort but on the whole, horses don’t vocalise as we do. Instead they pin back their ears, flare their nostrils, and generally change their body posture when they are alert, startled, scared or in pain. It is our responsibility as horse owners to recognise these subtle changes so we can address them quickly. What is my horse trying to tell me? Pay particular notice to your horse’s ears, eyes and face, as you can learn a lot from the shape and position of the ears or the facial expressions. Likewise, the head, neck and tail are good indicators of a horse’s emotional state, as well as the sounds they do make. When the ears are positioned forward, this generally signals a happy and relaxed horse. When they are sharply pricked forward, it means your horse is on full alert and is tuning into something in the environment. Be warned though, if the ears are pinned back this reflects unhappiness and may be followed by aggression. A horse’s eyes are large and ultra-sensitive to the slightest movement. For this reason, horses can be easily startled. When the eyes are wide and showing white (often called ‘wild eye’), your horse may be spooked or nervous and is ready to flee. Horses are flight animals so remember that fleeing is their most natural and immediate response when facing a perceived threat. ‘Snapping’ is a behaviour you may be less familiar with. It involves a horse repeatedly opening and closing its mouth in an ‘appeasement’ gesture, and is usually seen in immature horses when they are approaching another horse that they are afraid or unsure of. A raised head and neck position generally signals a state of arousal or high alert, while a lower position implies a more relaxed state. ‘Wringing’ or fierce swishing of the tail can be a sign of frustration or irritation. You may have seen this behaviour before in a horse reluctant to be worked or ridden. A gentler swishing of the tail however, is less cause for concern and usually accompanies a change in balance when being ridden, for instance. Neighs and whinnies are normally used to announce or acknowledge the presence of a horse and are never usually threatening sounds. Squeals, on the other hand, can be part of a threat display and can occur when two new horses meet. Snorts or ‘alarm calls’ are common in hooved mammals that live in groups as horses do and quickly convey an emotion e.g. fear, to the rest of the herd. Rolling or blowing snorts are different and can occur in times of excitement. 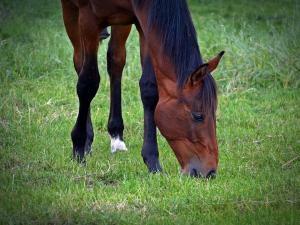 Knowing when your horse is in pain is another important skill horse owners should possess. Before you can decide that your horse’s behaviour is abnormal, you need to know what is normal for your horse in the first place. How does your horse usually interact with you and other horses? When and how often does your horse lie down? Does your horse always come to the stable door to greet you? Does he usually hang back at mealtimes? What is your horse’s normal posture at rest? It’s not about being medically trained or highly experienced with horses, but about paying attention to the minor details and observing with a critical eye. If you suspect a problem, follow your own gut instinct and get your horse examined by a vet. If you have any tips or advice on reading your horse’s body language, let us know! Interesting article and it tells me exactly what I have learn with my chap over the past 5 years. Especially the pain issue. I was not able to touch him at all at one time and this lasted about a week. I couldn't groom him, change his rug as he was telling me to stay away from him totally, I just turned him out. We got through it with patience and understanding. Ended up changing his feed and it hasn't happened since thank goodness . I have owned horses for many years and don't have a problem not recognising body Language. My Horses and I are well tuned in to each other and we do have respect for each other! I only have to say exscuse me and they move over, always saying thank you after, just like you would with a human being! Not many horses (if any) would respond in this way.